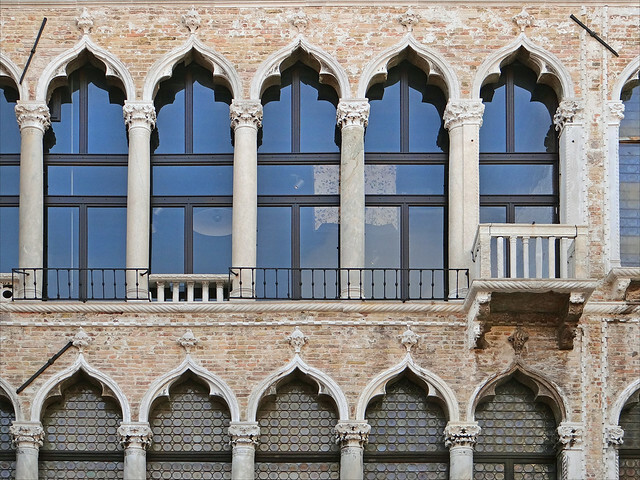 This Gothic palace was home to one of Venice's most important families for centuries, seven members of which served as the city's ruling “doge” between the 1414 and 1778. 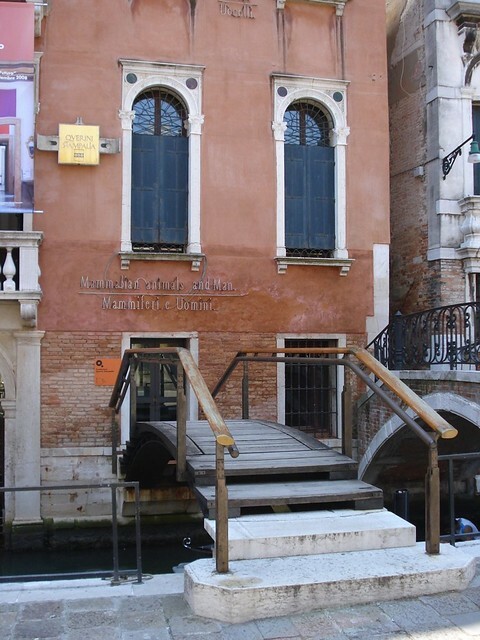 The building was bequeathed to the city of Venice in 1945 by the last remaining descendant, and was opened in the 1985 as the Study Center of the History of Fabrics and Costumes, housing the entirety of Venice's museum collections of historic fabrics and clothing. The Museum of Textiles and Costumes was completely renovated and expanded just three years ago, and now twenty rooms on the “piano nobile” are open to the public, including a new section dedicated to the history of perfume and halls displaying beautifully preserved original clothing and accessories dating from Renaissance Venice. The palazzo is known for its stunning frescoed ceilings, commissioned in 1787 to a number of Venetian artists to celebrate an important family wedding, and original walnut doors and gilded cornices. The elegant white marble facade of this 17th century palazzo is perhaps one of the most recognized along the Grand Canal, with three stories of towering arched windows separated by pilasters creating a pleasing symmetry offset by ornate stonework and balconies. Considered a jewel of Venetian Baroque, Ca' Rezzonico was commissioned by the aristocratic Bon family but finished by Giambattista Rezzonico, who purchased the incomplete building from the Bons after their financial ruin. The Rezzonico line died out in 1810, and after a century of subsequent owners and tenants (including Robert Browning and Cole Porter), the palazzo was purchased by the city in 1935. Today, Ca' Rezzonico is home to the Museum of 18th Century Venice, one of the finest museums in Venice, displaying a vast collection of art from the 1700's and lavish furnishings and decor gathered from a number of the city's most prestigious palazzi. Of the original artwork, only the excellently-preserved frescoed ceilings and trompe l'oeil wall decorations remain, including works by Tiepolo and Visconti. 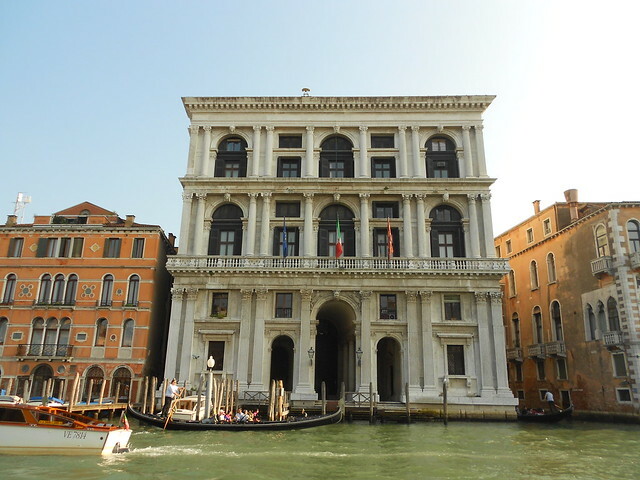 Another iconic facade along the Grand Canal is the delicate yet breathtaking 15th century Ca' D'Oro, one of the oldest surviving palazzi on the water. This Venetian Gothic style-palace was commissioned by the Contarini family, eight members of which served as “doge” between 1043 and 1676, and the nickname “palace of gold” was inspired by the original giltwork which once adorned the external walls. The building passed through a number of hands before being purchased by the baron Giorgio Franchetti in 1894, who restored the crumbling building to its original glory and filled it with his extensive art collection. Franchetti bequeathed the Ca' d'Oro to the Italian State in 1916, and it is now open to the public as the Galleria Giorno Franchetti alla Ca d'Oro, displaying masterpieces the Baron gathered from across Europe, including many plundered by Napoleon during his occupation of Venice. The most famous of these are Mantegna's “San Sebastiano”, for which Franchetti had a special chapel installed, works by Titian, and a few Flemish gems. 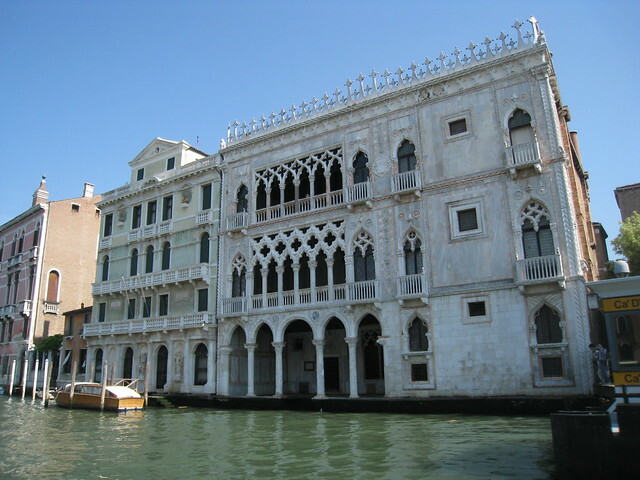 This 15th-century Gothic palazzo was once owned by the Pesaro family (not to be confused with the 17th century Ca' Pesaro, another magnificent palazzo owned by the same family which now houses the Gallery of Modern Art), but later purchased by the Spanish artist and designer Mariano Fortuny and transformed into his personal photography, painting, stage design, and textile design studio. 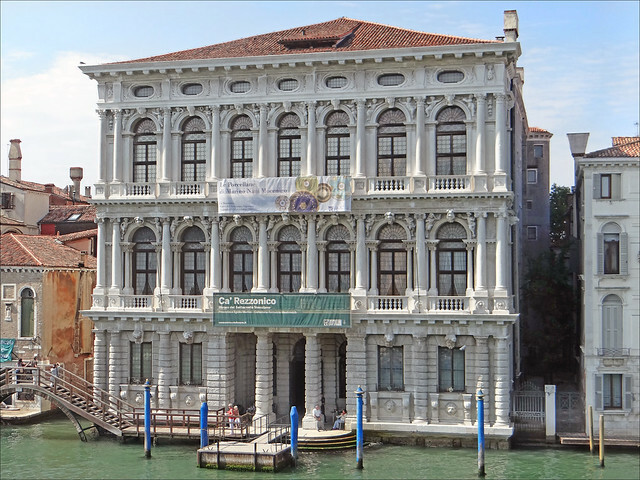 The Fortuny Museum was donated to the city of Venice in 1956 by Fortuny’s widow, and is home to works which illustrate the artist's eclectic passions. The studio rooms hold original photos, paintings, fabrics, wall-hangings, and lamps by Fortuny, and the palazzo's exhibition halls are used for contemporary art exhibitions. This gorgeous palazzo was completely rebuilt by the Grimani family between 1532 and 1569, and its meticulous restoration just a decade ago makes it a unique example of 16th century Venetian palazzo architecture and decor. The residence originally housed the family's extensive collection of Classical sculpture and archaeological artifacts, unfortunately since sold off (though a portion is still on display in Venice's Archaeological Museum), as was most of the original artwork. What remains, however, is breathtaking and the Palazzo Grimani Museum includes frescoes by Giovanni da Udine, the final remaining fragments of Giorgone’s “Four Elements” fresco, and a rare triptych by Bosch. The Chamber of Psyche and Chamber of Callisto are among the most lavish, though the entire palazzo is stunning. This opulent palazzo is one of the best preserved in Venice, if not all of Europe, and has most of its original decor, furnishings, and art collection still on display. In 1868, the last descendant of the historic Venetian Querini Stampalia family bequeathed the entirety of the palazzo and its contents to the city of Venice, stipulating that it be opened to the public and used to house cultural and educational events. The Fondazione Querini Stampalia collection includes the original antique furniture, paintings and sculpture, porcelain and draperies, stucco and frescoes, and other decor which faithfully reflect the style and culture of aristocratic Venice in the 18th and 19th centuries. In addition, the palazzo has a number of exhibition spaces for modern and contemporary art exhibits and live concerts.